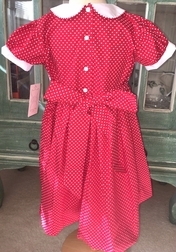 Precious smocked dress made with red and white dots fabric. It has a Peter Pan collar and a sash that ties into a big bow in the back. 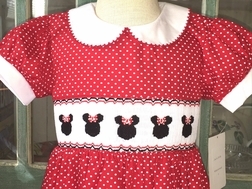 The front smocking is embroidered with 3 Minnie Mouse heads. We just love it! 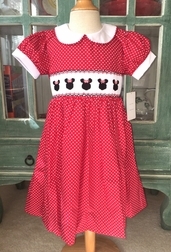 Perfect for Disney vacations and Disney Minnie Mouse birthday parties.